There’s nothing quite like a skyline-defining tower to get people excited. Earlier this week a proposal for an 80-storey tower in The Quarters known as the The Quarters Hotel and Residences caught the eye of many. Developers Alldritt Land Corporation LLP still need to get approval for the tower from City Council, something they’ll seek within the next year. But is this proposal really something we should get excited about? After decades without any new towers being built downtown, I completely understand the appeal of these proposals. 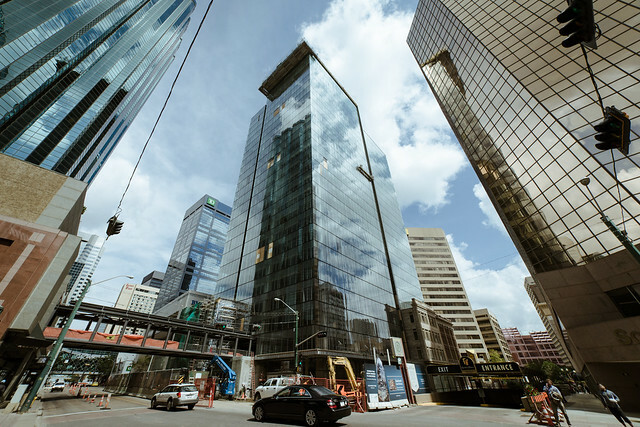 Especially with recent examples to point to like Enbridge Centre and the new City of Edmonton Tower, both of which are very attractive buildings. Not to mention the Stantec Tower, which will finally get Edmonton into the skyscraper club. Closing the City Centre Airport and removing the height restrictions over downtown made these buildings possible. But those are office towers, not residential towers, and they’re located in the heart of our commercial core. When we look at residential towers elsewhere in our downtown and the surrounding neighbourhoods, density is what should be important to us, not necessarily height. We want to increase the population of our core neighbourhoods, but we don’t need record-setting heights in order to achieve that. And in fact, such heights might actually be detrimental. There is one other potential benefit of the supertall towers aside from being attractive and it’s that in theory Council can negotiate with the developers to ensure there are public good contributions made in exchange for the height. The problem is that the last time that opportunity came up with the 45-storey Emerald Tower in Oliver, we didn’t end up with a very good deal. This is partly because there are no formal rules for those negotiations. Ideally this framework will be approved before the proposed Quarters tower goes to Council. There are other reasons to question proposals for supertall buildings, of course. Plenty of proposals have come forward and then quietly disappeared, such as the 71-storey “Edmontonian” tower that was proposed back in 2013. More recently, there are concerns about the vacancy rate downtown with the approved towers coming online and the impact that’ll have on the residential market. And on top of that residential towers like Brad Lamb’s Jasper House Condos which haven’t started construction yet are now lowering prices. For all of these reasons there’s no guarantee that the proposed Quarters tower will go ahead. Yes, it would be great to see The Quarters develop into a vibrant part of our downtown core, and maybe this building could help us achieve that. A supertall building there could do for The Quarters CRL what the Bow Building did for The Rivers District CRL in Calgary. It’s certainly better than a giant hole in the ground! But I’m not convinced a single, supertall building is what we should be pursuing for the area. Edmonton absolutely needs to build up rather than out, but we need to consider the impact that approving one supertall tower will have on the surrounding area. Multiple tall buildings is probably more desirable than one supertall tower.